Reproducibility of results in different laboratories is crucial to facilitate science. We participated in the interlab study to support the iGEM community and provide them with data for the comparison of measurement results between different labs. The headquarter has already confirmed that the bronze medal criteria for the interlab study has been fulfilled. All devices were transformed into Escherichia coli DH5α using 5 µL from the distribution plates. Colonies were picked and colony PCR was conducted to ensure whether transformation with the correct insert was successful. Afterwards the colonies were incubated overnight in 5 mL LB medium and 25 µg mL-1 chloramphenicol. For measurements two cultures of each device were grown overnight in 5 mL LB media with 25 µg mL-1 chloramphenicol at 37 °C. The bacteria cultures were diluted to OD600 of 0.02 in a total volume of 12 mL LB with 25 µg mL-1 chloramphenicol in 50 mL falcon tubes covered in foil and incubated in darkness for 6 hours at 37 °C and 220 rpm. 500 µL samples were taken after 0 and 6 hours of incubation and stored on ice until the measurement. Absorbance was measured by OD600, fluorescence by excitation at 485 nm and emission at 530 nm. To determine the amount of colony forming units (CFU) per mL the overnight culture of the negative and positive control were diluted to OD600 0.1 in LB medium with 25 µg mL-1 chloramphenicol in a total volume of 1 mL. The culture was further diluted in LB medium with 25 µg mL-1 chloramphenicol in five dilutions steps according to figure 1. Dilution steps three, four and five were put on LB plates containing 25 µg mL-1 chloramphenicol and incubated overnight. 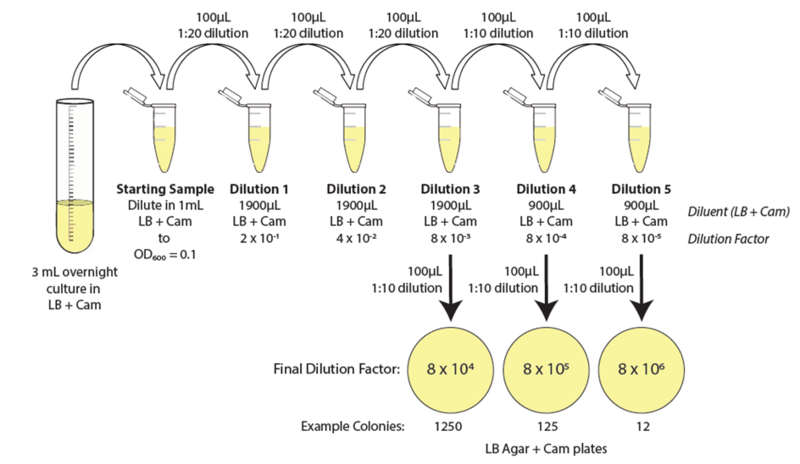 Figure 1: Dilution steps for measuring the CFU per mL of the negative and positive control. Figure from iGEM Headquarter. Incubator: We used the GFL Type 30/32 incubator at 37 °C and 220 rpm. We covered the glass front with paper to make sure the samples grew in darkness. Cuvette measurement: For the first OD600 measurement of the overnight cultures we used an Eppendorf 6131 BioPhotometer. Plate reader: Our plate reader model was the Tecan Infinite M200 (Roche). The excitation wavelength was set to 485 nm and emission wavelength was detected at 530 nm . 96 well plate: We used the 96 well microplates in black (polystyrene) from Greiner Bio-One for our measurements with the plate reader. In order to quantify the results of the Interlab Study two standard measurements have been carried out.The first standard curve shows the measures fluorescence of fluorescein in different concentrations (Figure 2) and the second standard curve shows absorption measurements of silica beads in different dilutions. 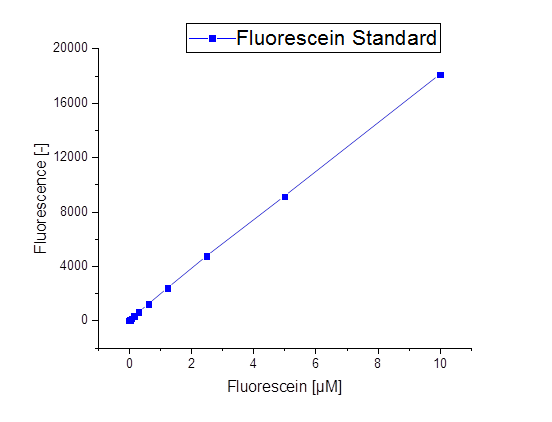 Figure 2: Fluorescein Standard curve. Fluorescein standard curve for calibration before measurements. Fluorescein has a similar emission and excitation as GFP. As all instruments vary in measurement units it is important to calibrate each instrument. 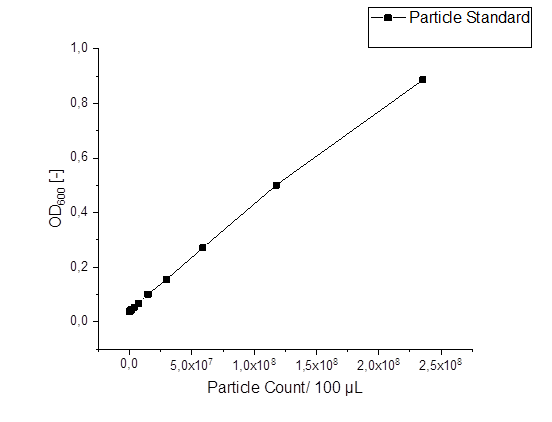 Figure 3: Particle Standard curve. Silica beads were diluted and absorption at 600 nm was measured.  This enables calibration of absorption measurement of the instrument. Cultures were treated as described in the protocol. The overnight cultures were diluted to OD600 0.02 and cultivated at 37 °C and 220 rpm for six hours. Samples were taken after 0 h and 6 h. The OD600 and fluorescence of all samples were measured. The OD600 after 0 h and 6 h can be seen in figure 4. The fluorescence of the samples after 0 h and 6 h can be seen in figure 5. In both figures it becomes clear that the growth of the colony seems to be independent from the fluorescence. The negative control shows of course the smallest fluorescence. The highest fluorescence has device 1 followed by device 4. Device 6 and 4 show the smallest fluorescence of the devices. The highest OD600 after 6 hours has the negative control and device 3. Device 5 reveals the slowest growth after 6 hours but does not show the smallest fluorescence. 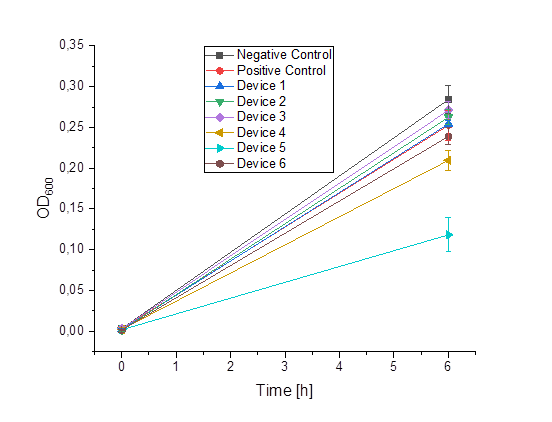 Figure 4: OD600 after 0 h and 6 h of the negative control, positive control and the six test devices. 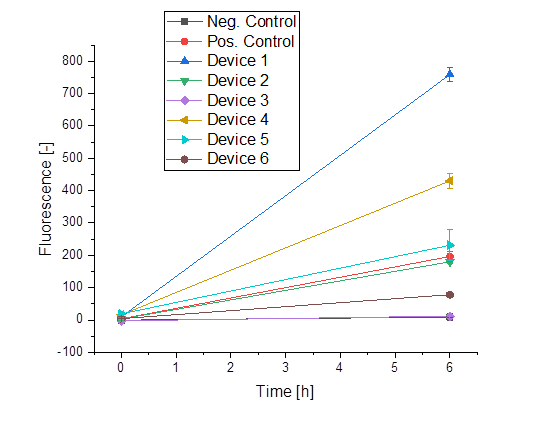 Figure 5: Fluorescence after 0h and 6h of the negative control, positive control and the six test devices. Furthermore the colony forming units per 0.1 OD600 of the positive and the negative control were determined. Overnight cultures were diluted to an OD600 of 0.1. The samples were diluted as seen in figure 1. Dilutions 3,4 and 5 were put on LB Agar + chloramphenicol plates. 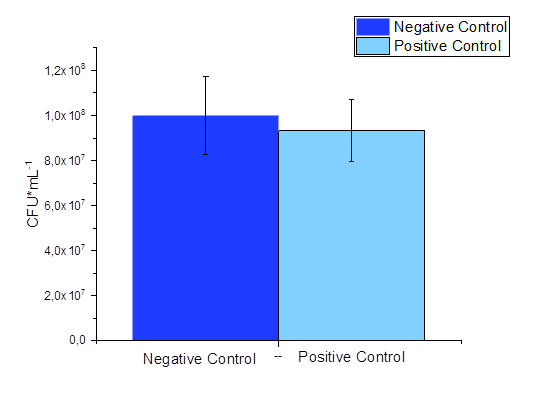 The CFU of the positive and the negative control is illustrated in figure 6. Figure 6: Colony Forming Units (CFU) of the Negative and the Positive Control. Dilution 3, 4 and 5 of both cultures were considered. Table 1: Colony forming units (CFU) of different dilutions of the negative and the positive control.